While The Hunger Games plows through with a force at the box office, being the number one movie three weekends in a row, I opted out for something that was more… on the non-thinking side. I saw Lockout this weekend. The short of it, we’re in the future, technology is amazing and criminals are sent to a prison in space where they’re put in stasis. There could be some effects, so the President’s daughter (Maggie Grace) has a bleeding heart for them and wants to see the effects if any. While taking a visit to the prison the inmates break out and take over. The government calls in Snow (Guy Pearce) to run a one man rescue operation. Queue the whacky-ness and explosions – go! The good; it’s Guy Pearce, haven’t seen him in a lead role in a while. I mean, he’s in things, but briefly. Let’s see if you’ve spotted him in these movies; The King’s Speech, The Road, Bedtime Stories and The Hurt Locker. 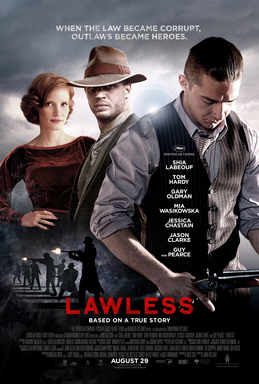 So Lockout is a departure from his usual dramatic roles, it’s nice to see him in the wise-cracking, gun-toting anti-hero. The opening scene with him over the credits was very amusing. The embracing of the cheesy over-the-top quality, this movie knows what it is and goes with it, at no point did I get the feeling that it was taking itself too seriously. And for that I applaud. One moment in particular is a very CG chase scene, the whole sequence is overly CG and when Snow slides off his vehicle on to oncoming danger, the blending works out, I know Snow is real while the background isn’t, but considering everything else looks that way, it just felt normal. Unlike a overly CG shot placed in to a movie to cover something up, which throws me out. Luc Besson‘s name is attached toLockout,for that fact alone I have faith that this movie will be entertaining, at the least. And I certainly was not disappointed. The bad; Guy Pearce, why is he doing this movie? Is this a stepping stone for his next bigger movie? Did he owe someone a favor? Or is he doing someone a favor in order to do his next movie? Just seems very unlike him and it took me a while to accept it. Very cliched set ups, you could see them going where they were going a mile off. I would’ve liked a twist or a variation on a theme with these set ups, something to spice it up. There’s one moment in the beginning where Snow is running away and sees his getaway future getaway vehicle. But the shot and the production design had us focus on a patch job on the wall behind the vehicle, that was confusing and sorta distracting. Another thing I have a slight problem with was the ending, they threw in too many twists here, I won’t go in to it for fear of spoilers. But they used the Tony Scott patented editing style, but not on crack just caffeine, which at this point in the movie was ok for a moment, but not as long as they dragged out that editing style. Then the twist where that thing they were looking for wasn’t there, but in plain sight the whole time. A more straight forward ending would’ve been more satisfying. Overall, I checked my brain at the door and had some high orbiting popcorn munching explosion filled goodness. This movie was just a lot of fun, and it could possibly be improved by having a running audio commentary while watching with friends. 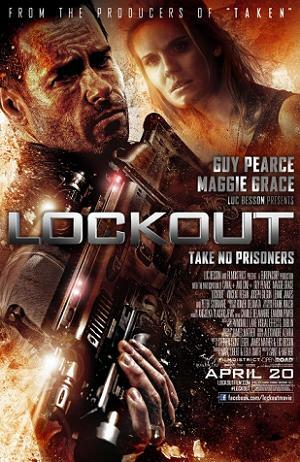 This entry was posted in Movies/TV and tagged action, explosions, guy pearce, lockout, lockout film review, lockout movie, lockout movie review, luc besson, maggie grace, prisoners in space on April 16, 2012 by Eugene.